Police have thanked hikers for parking considerately in the Brecon Beacons after dozens of cars were hit with fines in recent years. 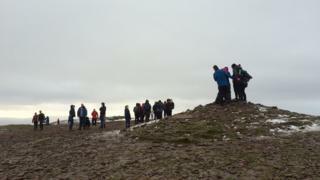 Hundreds were expected to walk up Pen y Fan on the first weekend of the new year, with the endurance Fan Dance event also taking place. In 2016, 115 drivers who parked on the A470 to visit the National Park during snow were fined. Dyfed-Powys Police said on twitter two cars parked on the road were ticketed. Road traffic officers had been patrolling the Storey Arms area, a popular starting point for an ascent of Pen y Fan, to make sure the road was kept free of parked cars. Sgt Owen Dillon, of the Roads Policing Unit had warned motorists they would be fined if they broke the rules. He had said: "We appreciate that the beautiful Brecon Beacons draw in thousands of walkers, and we encourage visitors to come and enjoy the region. "We just ask that they do so safely, taking into consideration their own needs, that of other walkers, and other road users who also want to come and enjoy what Dyfed-Powys has to offer." On Sunday the force thanked the majority of visitors for parking sensibly, but warned two motorists who had parked illegally should "expect fines £££ in the post".